I am RABUJOI’s resident Pessimist Reviewer. I’m impatient, hyper critical, caustic and, as an artist myself, particular about what makes a show visually worth watching. So, it is only fitting that my punishment for trash-talking Rail Wars!, Sailor Moon and Glasslip be to unearth ‘what is good’ about several shows on our B-roster. My first show is Love Stage! !, a water color style rom-com about Izumi, a directionless, effeminate college boy and his struggles to find an identity within his massively tallented show-biz family. Love Stage!! is about consequences, decisions and misunderstandings. You see, 10 years ago Izumi played the ‘little girl who catches the bouquet’ in a wedding commercial and his co-star Ryouma, who was never told Izumi was actually a guy, has carried a torch for Izumi all this time. Fast forward to today and the wedding company wants to film a reunion commercial with the original cast, now with Izumi as the bride to be. The ensuring chaos is fairly predictable: Izumi obviously doesn’t want to be a trap, his parents want him to take the job because he hasn’t figured out what to do with himself yet, and Ryouma is an episode away from experiencing a serious surprise! What is not predictable, and what makes Love Stage!! worth watching, is how Izumi comes to realize his crack-pot dream of becoming a manga artist is never going to happen unless he actually works on it — and he does really start putting work into it. In this way, Izumi himself is the first character to realize his own misunderstanding, and we see him make a decision to correct it and live with the consequences. What also makes Love Stage!! enjoyable is how sincere and positive all the characters are. Izumi’s parents, while pushy, never shout at him for falling short of their expectations or making poor life choices. Nor does Izumi mope too long over the mess his life has been and the mess his life is about to be. 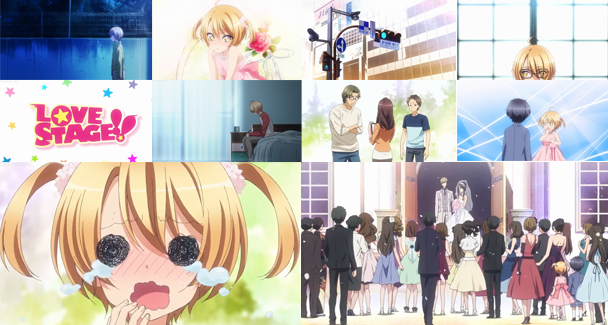 Love Stage!! is just a warm, happy show and I respect that in a sea of otherwise broody or whiny rom-coms. Also, i swear Izumi’s dad’s mustache is glued onto his face! Nice review. The stills scream “earnestness!” Also, anime mustaches can be deceptively difficult to pull off! Earnest is the best description for it, actually. (curse you and your better word choice!) People are just people, having fun with their lives and looking for more of it. It’s the situations that are wacky and over the top. It’s refreshing (and interesting) to see that combination, really. except Izumi’s mom. She’s about as thought out as Izumi’s dad’s mustache! Indeed! facial hair is hard to anime’ify because the anime face is already heavily short-handed. There isn’t much structure on it (intentionally) so when you render a highly detailed, structure centric item like a handle bar on a dude’s face… it looks out of place simply by contrast. But apart from that, the anime so far is fun, light and far from pretentious, which adds to its charm.